BY BENJAMIN W. L. DERHY, F.I.N.S. It is common knowledge that Napoleon liked to writeÔÇ� The Emperor would maintain an abundant correspondence throughout its life, both with regards to State matters as well on a purely private basis (with his wives Joséphine and Marie-Louise, with his brothers and sisters, and with various other acquaintances). The thousands of letters written by Napoleon enabled him to stay in touch with his close relatives, as well as to be aware of all that was occurring, and consequently, to keep controlling everything, or almost. But could it be that his letters, or rather, one of them, led the legendary ruler to his doom? The following is taking place at the end of March 1814, during the Campaign of France. The French Empire is in the middle of the War with the Sixth Coalition, where, the Russian Empire, the Austrian Empire, the United Kingdom, Sweden, the Kingdom of Spain, that of Portugal, and those of Sicily and Sardinia opposed the French Empire, the Kingdom of Italy and the Duchy of Warsaw. Napoleon dedicates all his strength and means in order to stop the invasion of France by the enemy and, by consequence, to preserve his throne. On March 19, the congress of Ch�ótillon ends, after an ultimate negotiation failure, as the Emperor refused to lose territories such as Alsace, and the enemy to come to peaceful termis without disminishing the French Empire. The next day, Napoleon arrives at Arcis-sur-Aube, along with a total 55,000 men, wishing to go through the city towards Bar-sur-Aube. However, the French troops are stopped by the army of Schwartzenberg, composed of 200,000 soldiers, most of them reputedly being among the best of Europe. After long and painful battle, Napoleon has no other choice but to retreat and go in direction of Vitry-le-François. On the 23rd, rather than facing the armies of Blücher and Schwartzenberg, Napoleon decides to march towards Saint-Dizier. J'ai été tous ces jours-ci �á cheval. le 20 j'ai pris Arcis-sur-Aube. L'ennemi m'y a attaqué �á 8 heures du soir; le m�¬me jour je l'ai battu et lui ai fait 400 morts. 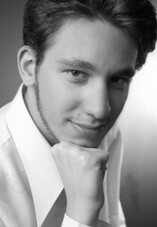 Je lui ai pris 2 pièces de canon, il m'en a pris 2, cela fait quitte. Le 21, l'armée ennemie s'est mise en bataille pour protéger la marche de ses convois sur Brienne et Bar-sur-Aube. J'ai pris le parti de me porter sur la Marne et sur ses communications afin de le pousser plus loin de Paris et me rapprocher de mes places. Je serai ce soir �á Saint-Dizier. Adieu, mon amie. Un baiser �á mon fils. I have been all these days on horseback. On the 20th I took Arcis-sur-Aube. The enemy attacked me there at 8 in the evening; the same day I beat made him 400 casualties. I took him 2 pieces of canon, he took me took 2, we are even. On the 21, the enemy's army moved to protect the path of its convoys at Brienne and Bar-sur-Aube. I decided to go to the Marne and on his communications in order to push him farther away from Paris and get closer to my places. I will be at Saint-Dizier this evening. Good-bye, my friend. A kiss to my son. 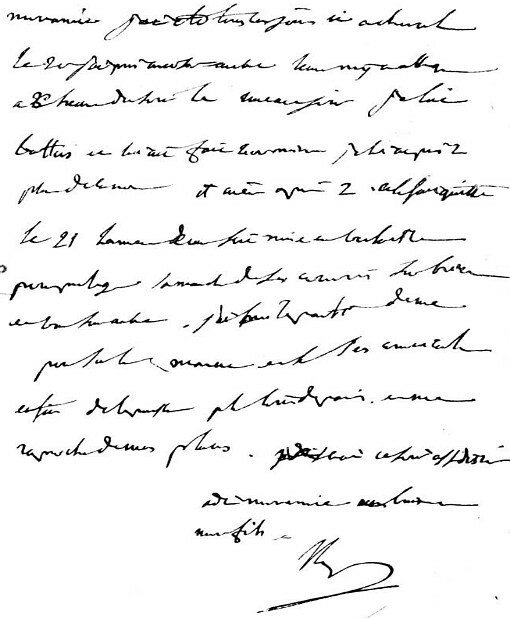 This letter, revealing not only the exact position of Napoleon at a precise moment (“I will be at Saint-Dizier this evening”), but also his projects (“I decided to go to the Marne and on his communications [system]”, as he had done to the Army of Silesia at Champaubert and Vauchamps, “in order to push him farther away from Paris and get closer to my [strong] places”) was intercepted by the enemy, along with other confidential documents. The other letters, sent by Savary, commented on the (depleted) state of the resources of the army. A copy the seized correspondence was then immediately transmitted to Schwartzenberg, who forwarded it right away to Emperor Alexander, who received the despatch at one o'clock, while the original letter written by Napoleon sent back to its original recipient, Marie-Louise, probably in order not to raise any suspicions, and perhaps out of courtesy as well. While the allies' headquarters had no idea of anyone's intentions, the enemy knew perfectly well Napoleon's plans, and that of the most reliable possible source, the Emperor himself. The following day, the enemy, aware of the plans of the Emperor, is also in possession of another document in which Savary, still in Paris, announced to Napoleon that Paris was no more totally dedicated to the French ruler. The coalition subsequently decides to attack the capital and, one day later, the enemy beats�á marshals Mortier and Marmont at Fère-Champenoise. On the 30th, Paris is attacked from every side. An armistice is rapidly signed and Alexander and his troops enter the capital the next day. Napoleon is at Juvisy at that time. Deposed by the senate four days later, he would be forced to abdicate, signing the Treaty of Fontainebleau on April 11. In any case, it is not the historian's role to speculate on what may or may not have happened, had the circumstances been different, for, otherwise, the said historian would lose their detached, scrupulous, and factual outlook on things, only to become a mere speculator. I shall thus end this paper here, after just one last remark: despite being knowledgeable people, well-versed in history and with high educational standards, we might tend to disregard one simple fact, or, as Jean de la Fontaine would say, the moral of this story: even the greatest of men can fall because of the smallest detail overlooked, or possibility not considered. Let us reflect on that with humility, as Napoleon, once more, teaches us a crucial and valuable lesson. Ô���á Alison, A. (1841) History of Europe from the Commencement of the French Revolution to the Restauration of the Bourbons, vol. IX. Paris: Baudry. 200-1. Ô���á Alison, A. (1861a) Epitome of Alison's History of Europe, Tome 15 (2nd ed). Edinburgh: Blackwood., 507-12. Ô���á Alison, A. (1861b) Lives of Lord Castlereagh and Sir Charles Stewart, Volume 2. Edinburgh: Blackwood, 249-51.